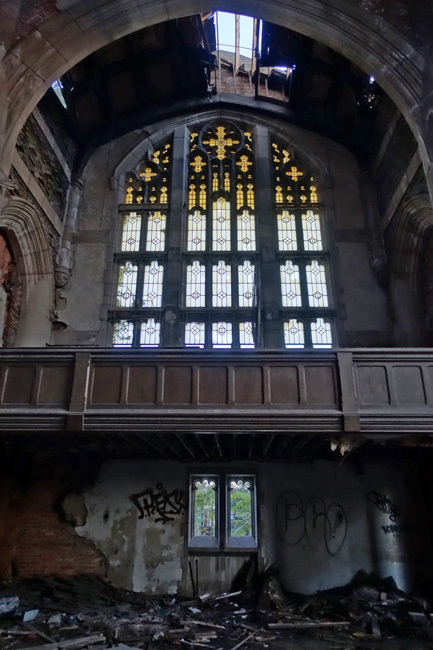 City Methodist Church of Gary, Indiana is arguably the most beautiful example of urban decay in the Rust Belt. 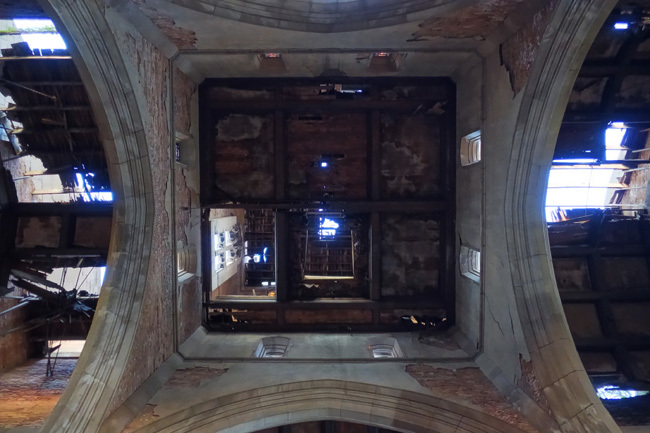 The Gothic Revival structure, which stands in ruins after decades of neglect, arson and vandalism, is stunning to behold. 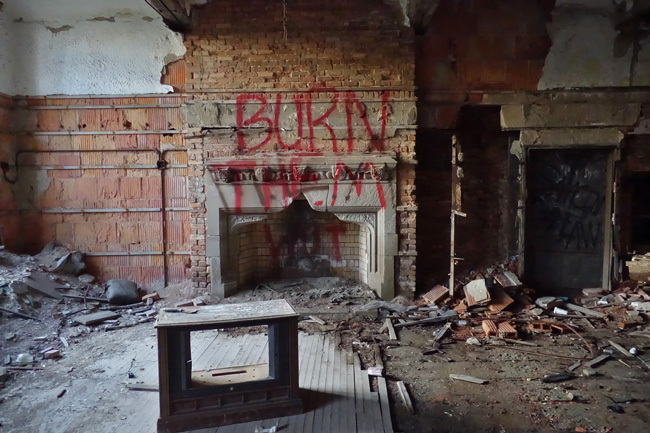 After exploring an abandoned power plant in the Chicago suburb of Dixmoor, IL, I continued east to Gary, Indiana. I knew it was the epitome of a Rust Belt city: a declining population, job losses, a reputation for high crime. But nothing could have prepared me for what I'd find there. Driving into Gary, Indiana is a strange, unsettling experience. 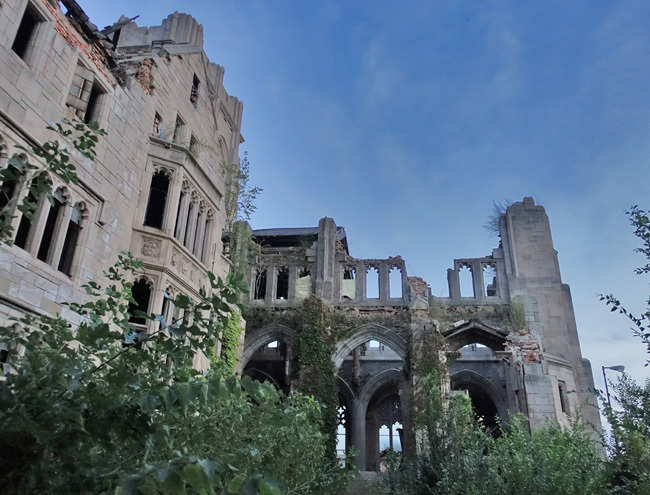 A third of the buildings there are abandoned. 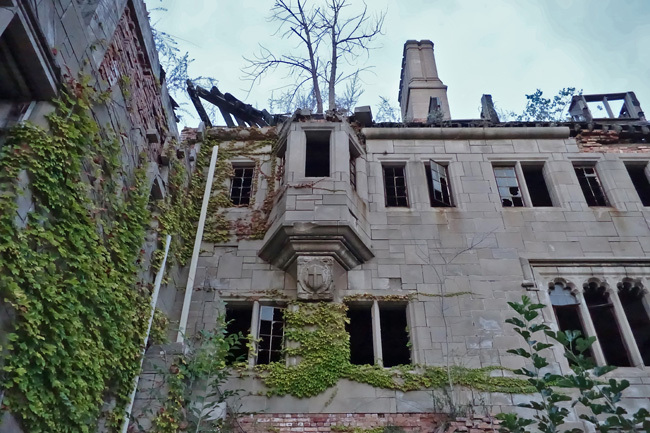 What were once homes and businesses are now vacant, crumbling structures, their walls tagged with graffiti and overtaken by creeping ivy and weeds. 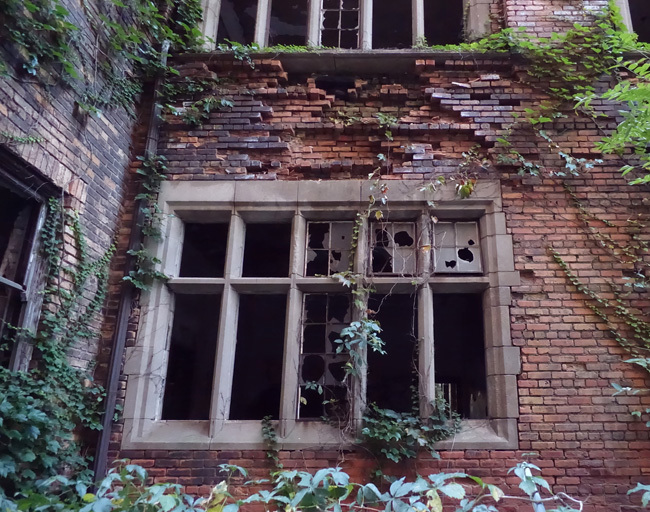 Windows are boarded up or shattered and gaping. 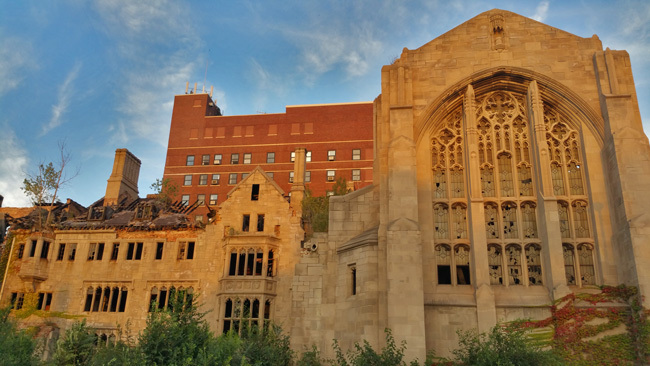 As someone who is fascinated by abandoned places, I was excited to explore the history of this city, but my enthusiasm was overshadowed by an unexpected and profound despair. It is hard to witness such desolation without feeling a sense of hopelessness. The daylight was fading fast, but I was determined to explore at least one site before nightfall. 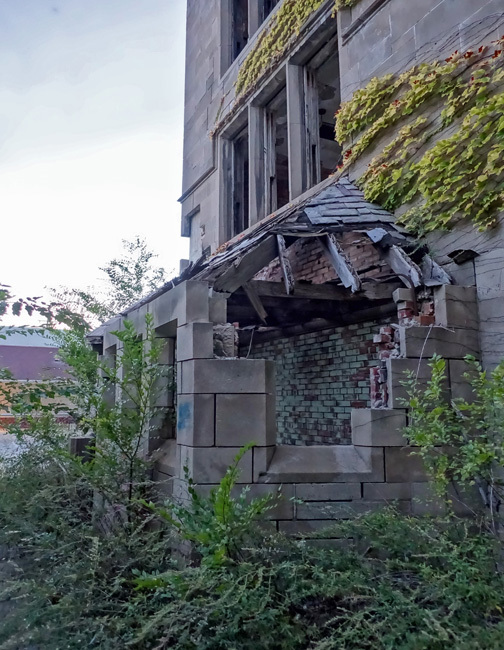 When I pulled up to the ruins of City Methodist Church, a few kids were hanging out in front of the school across the street. On the next block over stood a row of modern homes. 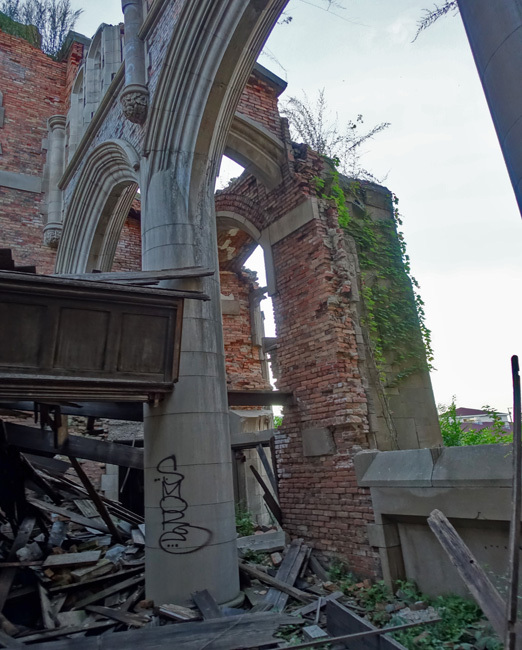 It was strange to see the overgrown, collapsing ruins of the old church alongside a well-kept residential neighborhood. It is a common pattern throughout the City of Gary. Gary, Indiana was founded in 1906 by the United States Steel Corporation as the home for its new Gary Works plant. In its early years, the population was fairly diverse; nearly a third of its residents were immigrants from Eastern Europe. The city was named after Elbert Henry Gary, a lawyer and the founding chairman of the United States Steel Corporation. Gary Works, once the world's largest steel mill, is still the largest integrated mill in North America and the city's largest employer. In 1919 Gary was the site of a major steel strike. Rioting became such a problem that the Governor of Indiana declared martial law and over 4000 federal troops were brought in to restore order. Gary is also famous for being the birthplace of The Jackson 5. 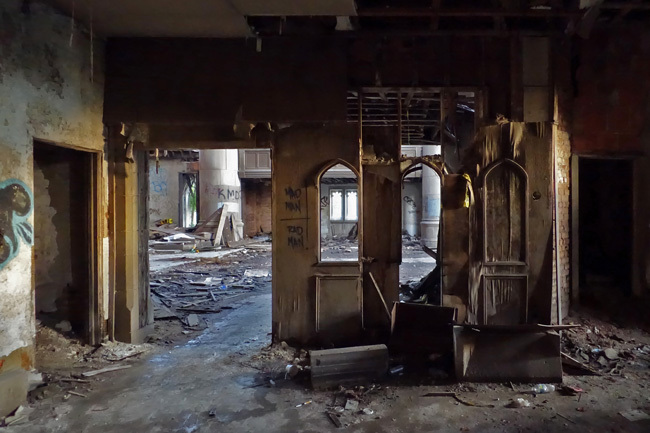 As is the case with many Rust Belt cities, Gary, Indiana began to suffer from increased competition from the steel industry overseas during the 1970s. The city fell into a downward spiral of job loss, falling tax revenue, increased crime, and a shrinking population. It has still not recovered. Gary Works and its associated facilities employed over 30,000 people in the early 1970s, but by 1990 that number had fallen to only 6,000. At the time of the 2010 census, the population was 80,294, a 55 percent decrease from its peak of 178,320 in 1960. 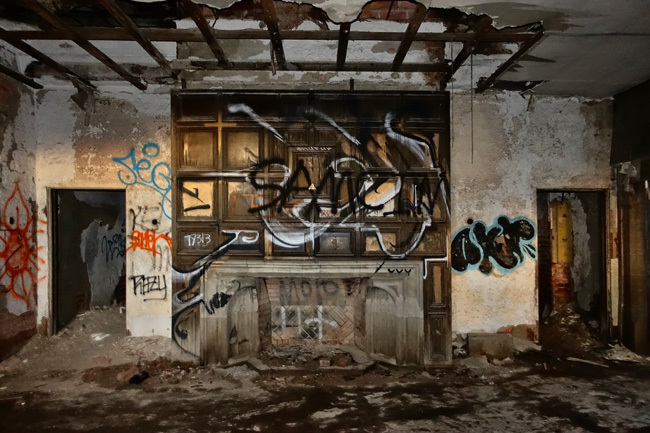 As of 2013, the Gary Department of Redevelopment has estimated that one-third of all homes in the city are unoccupied or abandoned. 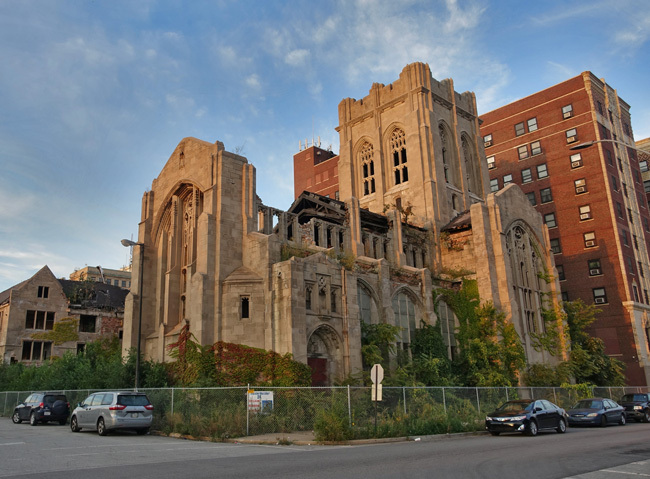 City Methodist Church is one of Gary's most recognizable landmarks. Standing abandoned since 1975, it has become a symbol of the city's decline. 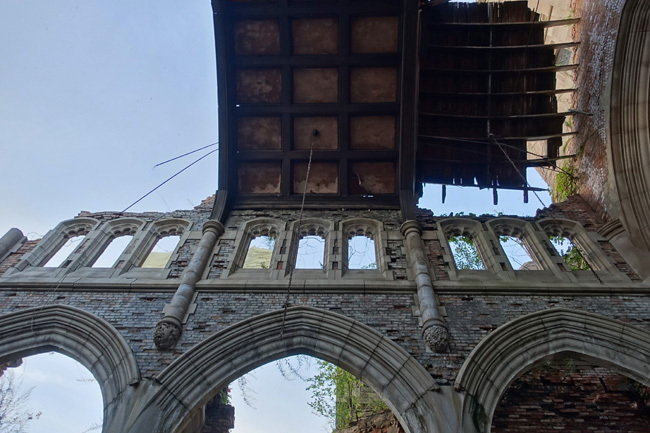 Hauntingly beautiful, the old church has been featured in many movies, including the 2009 remake of "Nightmare on Elm Street" and "Transformers 3." Construction of City Methodist Church began in 1925 at a cost of $650,000 (equivalent to over $8.8 million in 2016 dollars). The U. S. Steel Corporation contributed 50% of the building cost. Due to rising expenses and planning errors, the church was built smaller than its original specifications, but is still an impressive structure. The leadership of City Methodist Church was progressive for its time. During an era of segregation, people of any color were welcomed into the congregation. 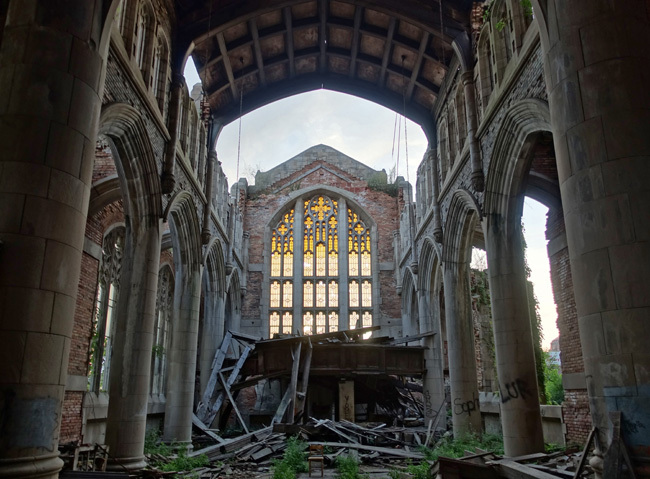 By 1973, church membership dwindled to 300, down from a high of 3000. 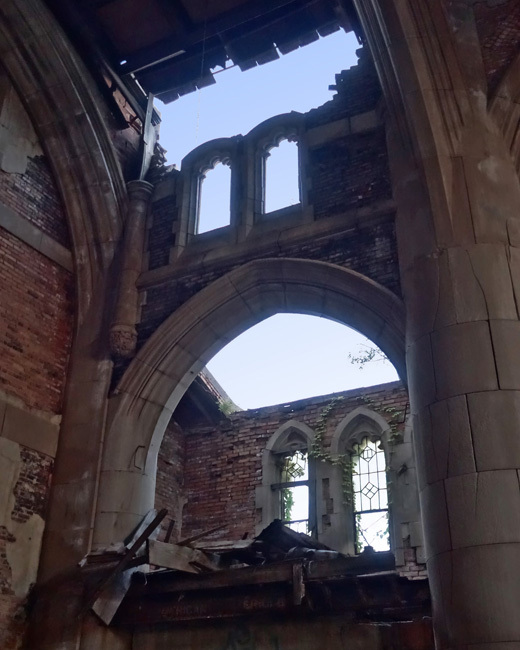 In 1975, the church closed and has remained vacant ever since. City Methodist Church and many other historic buildings were badly damaged in the Great Gary Arson of 1997. Large portions of the ceiling have collapsed. The sun set as I finished up exploring the old church. After an exhausting day of travel and exploring, I was ready for a good night's rest. 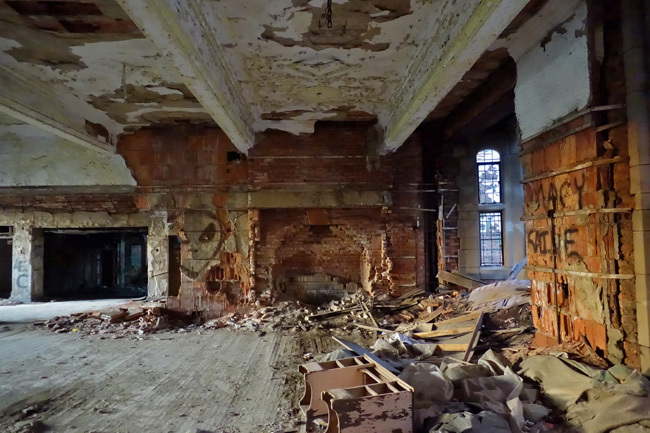 I could hardly wait for the next morning, when I'd explore the massive abandoned Horace Mann School. Great new feed, love the history and the pics mate, looking forward to seeing more of Gary, Indiana! 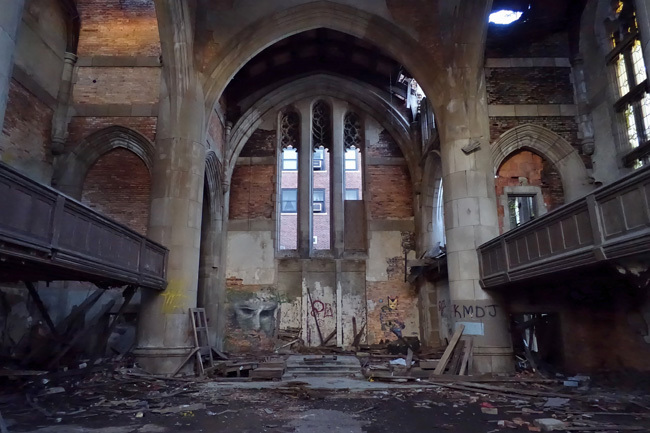 I've seen many photos of City Methodist, mostly wide-angle and always stunning. You've given us some interesting interior shots focusing on details and I really appreciate that perspective. Thanks! Thank you, Ayesha! :) I'm glad you enjoyed the article! I was born in Gary. It's sad to see its demise. Thank you for finding the beauty in it. This church is absolutely amazing! I always wish you would post more photos...lol! I can't get enough of your photography and stories/history behind the photos. Thanks, Heidi! I can't imagine what it must be like to see your hometown in this condition. Gary has so many beautiful historic structures. I hope at least some of them get preserved. I'm glad you're enjoying my photos so much :) I can't include too many of them here or else the page takes too long to load, but I have plenty more on Instagram, Facebook, etc. Great video. Thanks for sharing. Such an interesting place to explore.